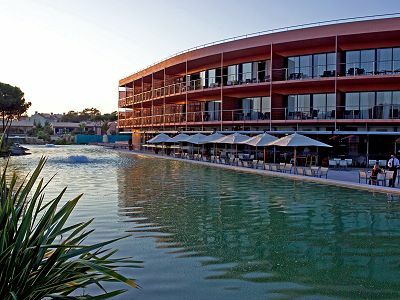 Pestana Vila Sol Golf & Resort Hotel – ideally located just 5 minutes from Vilamoura Marina, Algarve with extensive leisure, dining and service. Golfers can enjoy the celebrated 27-hole Vila Sol Golf course with attractive multi-round packages for residents. Pestana Vila Sol is also within a short drive of some of The Algarve’s most popular beaches – with complimentary shuttle service from June-September. With 189 spacious, inviting rooms and suites, the hotel consists of a main building surrounded by sets of Mediterranean style villas with rooms and suites, harmoniously framed by lakes and vast gardens. Unlimited Golf Packages are available at Pestana Vila Sol for 7 Night stays. Unlimited Golf allows play on Pestana Vila Sol, Gramacho, Pinta Silves & Alto courses. Listed Package Prices: Listed Golf Package prices apply with Unlimited Golf for 7 Days. Vila Sol Golf is set within a beautiful valley of lakes and lush vegetation. It features 27-holes comprising of three nine-hole courses, the Prime, Challenge and Prestige. The Prime loop is the most difficult of Vila Sol Golf. The long and narrow fairways of the first four holes are renowned as “the most difficult start” on the Algarve. The Challenge loop is better known as the back nine of Vila Sol. The challenge of this loop is that its greens are more hilly than either Prime or Prestige, demanding accurate approach play. The Prestige loop is a shorter loop, but narrower. Accuracy and not length is by far the deciding factor on this nine. Vila Sol was designed by Donald Steel, an English architect who above all likes to preserve nature and native vegetation, minimising earthmoving where possible. The resort twice played host to the Portuguese Open in the 1990s and regularly hosts other professional events. Classic Room, Breakfast, Golf as Listed, Local Taxes. Golf Option: Play Pestana Gramacho, Pinta, Silves or Alto in place of Vilasol without further charge. Golf Transfers Extra.